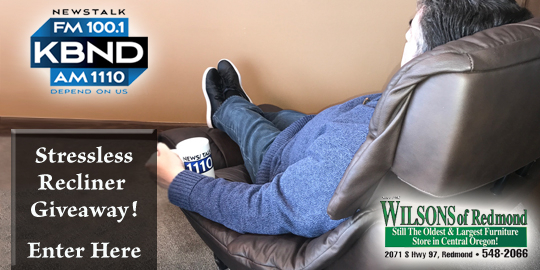 Win a Stressless Leather recliner from Wilsons. Register here and please provide a phone number you can be reached at during the morning. Then listen to the Morning News from 6 to 9, March 28 - April 15, 2019. When you hear your name call (541) 388-1110 within 100.1 seconds and you'll be qualified for the Grand Prize drawing of a Stressless Leather recliner from Wilsons of Redmond. Then listen on April 16th for the Grand Prize Drawing.